When it comes to technology in the elementary classroom, I'm becoming more and more convinced that SeeSaw is the place every elementary teacher should begin. I'm working with two teams of PreK teachers to pilot the app in our district, and the things they're reporting back are amazing: four- and five-year-olds chronicling their work, building e-portfolios, and effortlessly strengthening school-home connections by using the SeeSaw Parent app. If four-year-olds can do it, so can you. All you need is one device (an iPad is preferable, but anything with a browser will work) to get SeeSaw-ing in your classroom. 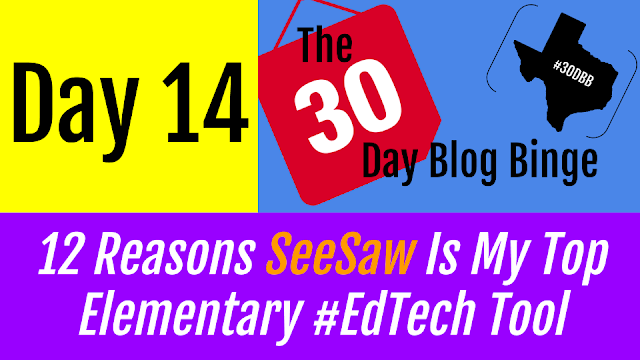 Here are my top 12 reasons to start with SeeSaw. SeeSaw is completely free for teachers to create up to 10 classes. SeeSaw makes their money by campuses choosing to adopt SeeSaw for all their students or if a parent signs up for the Premium version (which isn't required). As a classroom teacher, though, you won't be charged a dime. Even if you only have one device in your classroom, juggling classes is a walk in the park. With iPads, students tap "I'm a Student" and scan their class QR code you can post anywhere in your room. With Chromebooks or laptops, they just use a text code to log in to their class. When it's time to capture student work, it's a very simple process: tap the green plus button, choose a form of media, record it, and select the students' name. The work is automatically added to the student's portfolio, waiting your approval. Students capture their work, but before it ever reaches their portfolio, it has to be approved by you. And approval is simple: log in as yourself, then either do a mass approval of all submitted work or individually approve or reject student work. Ultimately, you want students capturing their own work, but if you need to rapid-fire capture and upload, sign in to the iPad app as a teacher. Now, if your students are presenting and you want to take videos of them, once you record, just tap their name and it will be automatically added to their portfolio without requiring your approval again. SeeSaw lets students take pictures, record video, make whiteboard drawings with voiceover, upload anything from the iPad's Camera Roll, type a note/journal entry, or add a link to anything they've created or found online. The Camera Roll feature is especially awesome, because as you branch out and start using other iPad apps, any app that outputs photo or video can be included in a student portfolio. It's a slick way to be able to gather all your students' work neatly in one place and make SeeSaw your central hub for students to submit digital work. There will be times you want to see your entire classes' work, times where you want to only see one student (think parent conferences), and other times you choose to see everything captured on a particular date. Big, clear icons let you quickly toggle between those three views, making it easy to see work however you need to see it. Much to the chagrin of educators, a certain classroom blogging service for children that started charging this year. But like a superhero swooping in to the rescue, SeeSaw added blogging to the free services they offer. Students can add anything they've recorded to the public class blog (with your approval), and they can upload Notes as more traditional blog posts. Additionally, as a teacher it only takes one click to add work to the blog. Your class blog can be completely public, or it can be password protected. Seesaw also only includes first names with student work, making sure to maintain the privacy of your young learners. Within your class settings, students can be allowed to comment on each others' work. In a world where online interaction is becoming more frequent than face-to-face, kids need to practice giving feedback in a constructive and positive way. If we don't give them a chance to practice citizenship in a safe environment, they're going to have no idea how to do it when they leave us. SeeSaw lets them explore what it means to be denizens of an online community in a place where mistakes can be corrected. Getting parents involved with SeeSaw is easy: download the pre-filled PDFs, each with a unique QR code, and send them home. Parents download the SeeSaw Parent app, set up an account, scan the code, and have instant access to their students' work. Any time new work is approved by the teacher, parents get a notification. No lost papers, no excuses, no more "What did you do at school today?" It's all in the palm of their hand. When students upload work to SeeSaw, it can be downloaded without restriction by teachers and parents. This means that videos, photos and more can be kept forever. This says a lot to me about SeeSaw's intentions to keep the platform student-centric: they could easily have created a proprietary file format that's inaccessible without an upgrade, but they've kept it delightfully, thoughtfully open. In more and more schools, students are being introduced to working from an LMS as early as 3rd or 4th grade. SeeSaw can function as an LMS with training wheels for the primary set. Teachers can add links to videos, playlists, a BlendSpace or anything else, and assign it to everyone in the class. The students then open up SeeSaw and have their assignment for the day. I was talking to a 2nd grade teacher in another district recently, and she's started assigning work this way even when she's going to be out of the building. Students know to log in, get their assignment, and start posting their work in the app. Wherever the teacher is, she pulls out her phone and starts giving feedback through SeeSaw's commenting feature. She said that parents will even jump in the conversation during the day. Autonomy, self-pacing, accountability...it's like the Holy Grail of 21st Century learning environments. And these are 8-year-olds. SeeSaw is one of the best tools for organizing, sharing and creating student work. 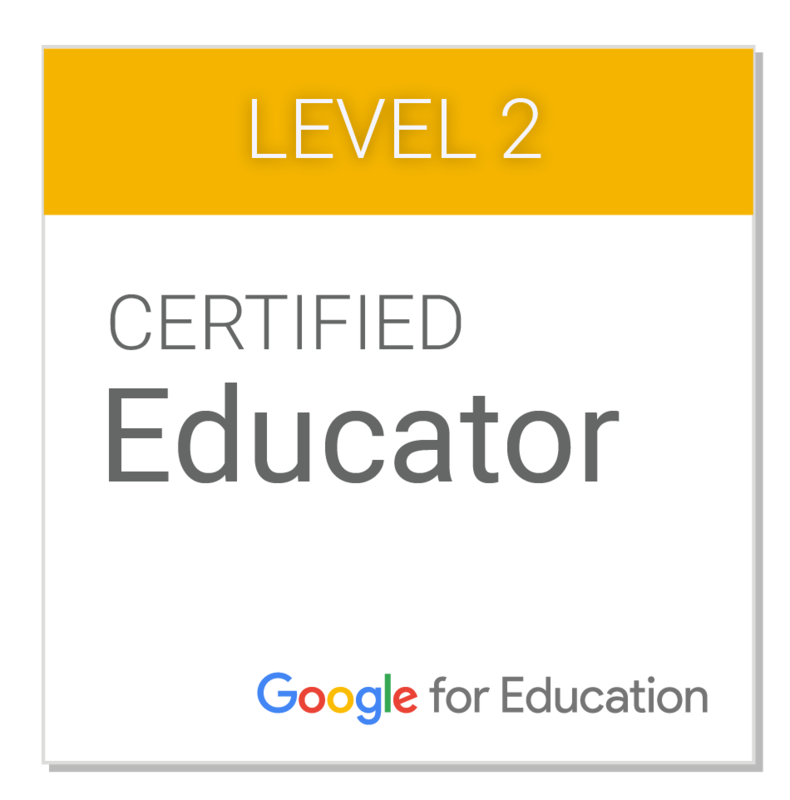 It makes a process that used to require collecting endless stacks of paper into a streamlined workflow that will quickly become a part of your classroom routine. 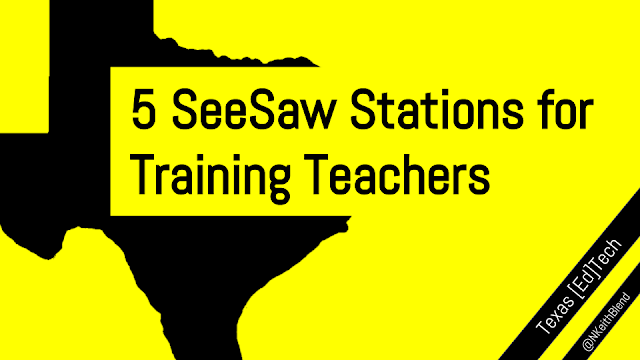 If you're an elementary teacher who's just getting started with edtech, you should make it a point to get started with SeeSaw.